Did you know that Illinois residents pay the second-highest property taxes in the U.S.? According to a report brought to our attention by the Chicago Tribune, Illinois comes only behind New Jersey in terms of property taxes. Property taxes are collected by state and local governments, and go towards any number of essential functions, including providing funding for schools, infrastructure, public works projects, first responders, and more. But while they’re a fact of life, and part and parcel of homeownership in the cities and counties around Illinois, property taxes can be mystifying for many residents. In large part, this is because the process that is used to determine what someone pays in property taxes can be dense, and difficult to understand. Let’s talk over how property taxes are determined in Illinois, to see if we can provide an introduction to this important topic. Note: To make things simpler, we’re only going to go over the broad strokes here. For a more in-depth discussion of property taxes, including understanding your unique property tax situation, you may want to reach out to our team directly. In a free consultation, it may prove much easier to explore the nitty gritty details, provide concrete examples, and discuss questions and concerns unique to your household. To start understanding your property tax payments, you have to consider the big picture. For Illinois residents, the property tax process begins when your local government determines its budget, and how much funding it needs for various taxing bodies and organizations (such as school districts, fire departments, forest preserves, special projects, and so on). There are laws and restrictions which limit how much tax rates can rise in a given year, so these rates do not tend to grow or shrink explosively. At this point, your area has an aggregate tax rate. Now, to determine what you pay, this rate is put in play with some of the factors unique to you and your property. To start, there’s the market value of your home. Working on a regular schedule, county assessors use market trends and sales research to assign your home a value. Depending on where you live, assessors take a percentage of this market value to determine your property’s assessed value. In Cook County, for instance, the assessment level is 10%. Next, an equalization factor/multiplier is applied to your assessed value. This determines your property’s equalized assessed value. The last factor to consider is the exemptions that may apply to you and your property. 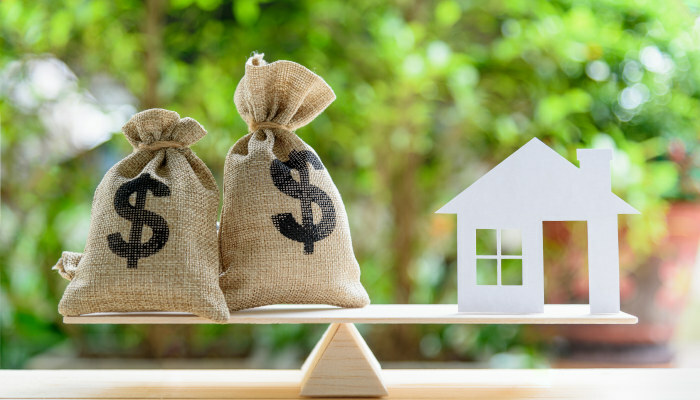 In Illinois, for instance, you may be able to qualify for property tax exemptions if you use the property as your primary residence (this is known as the homeowner exemption), are a senior citizen, have served in the military, and so on. Residential and commercial properties qualify for different types of exemptions, and are taxed at different rates. Finally, equipped with all this information, your estimated tax bill is determined. The formula is actually fairly simple, once you understand all of the component parts: Deduct the total amount of your exemptions from your equalized assessed value, then multiply this by your aggregate local tax rate. Another thing to keep in mind is when and how you’ll receive and pay your property tax bill. In Cook County, for instance, property tax bills are distributed twice a year, and are paid in arrears – meaning that you’re paying last year’s property taxes. As you can see, calculating a tax bill can be a complex process, with many different factors coming into play. As a result, there can often be discrepancies that come up when it comes to individual properties, as compared to neighboring homes. In some cases, homeowners may be able to appeal their property tax assessment; many find that bringing on an attorney makes the appeal process more streamlined and effective. Have any questions about your Illinois property tax assessment or final bill? Curious about any other aspect of real estate law in Illinois or Chicagoland? Don’t hesitate to get in touch with the attorneys and staff of the Gunderson Law Firm for your free initial consultation, or read on in our “Community” section, available here.